Samsung Electronics has apologised to Chinese consumers after a report carried on China's state TV claimed some of its phones were malfunctioning. 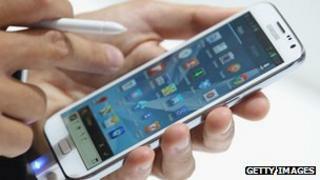 The report alleged the phones were crashing due to faulty memory chips and criticised its repair policies. Samsung, which generates nearly 14% of its overall revenue from China. said it would provide free repairs for the seven models mentioned in the report. In a separate development Samsung was also fined by Taiwanese authorities. Taiwan's Fair Trade Commission levied a fine of fined 10m Taiwanese dollars ($340,000; £210,000) over allegations that Samsung had paid money to people to criticise rival's products. China has become a massively important market for many global brands, not least those in the technology sector. However, as many have been finding out, the price of doing business in China can include a willingness to accept ritual humiliation. A pattern has emerged. It starts with criticism of a big name foreign firm's products in consumer reports on Chinese state TV, sometimes for apparently minor complaints. That firm makes little effort to defend itself. Instead it immediately issues a grovelling apology accompanied by a fulsome promise to make good. Apple went through this a few months ago. In April, chief executive Tim Cook issued a "sincere" apology for his company's perceived arrogance and disregard of Chinese customers. Other international names, including Hewlett-Packard, Hyundai, McDonald's, Carrefour, Volkswagen and now Samsung have been through something similar. Continued access to the Chinese market, it seems, compensates for the occasional need to eat humble pie. The combination of a growing economy, rising income levels and a large consumer base has made it a key market for leading global firms. However, as foreign companies continue to grow their business in China, they have come under increased scrutiny. Samsung, which is the latest foreign firm to be criticised in the Chinese media, said in statement that it "sincerely apologises" to Chinese consumers for inconveniences caused by the company's "management problems" and that it welcomed the media scrutiny. The models mentioned in the China Central Television (CCTV) report on Samsung, which was aired earlier this week, include the Galaxy S3 and the Note2 phones. Earlier this week, a separate report on CCTV claimed that Starbucks, the world's largest coffee chain, was charging higher prices in China than in other major markets. It alleged that Starbucks earned higher margins in China due to its pricing. The media accused the firm of arrogance, greed and of "throwing its weight around". The fine in Taiwan came after an inquiry by the Fair Trade Commission alleged that Samsung had hired the services of an advertising firm, OpenTide Taiwan, to help it with online marketing. Sun Lih-Chyun, vice chairperson and spokesman, told the BBC's Cindy Sui in Taipei that its investigations had indicated that OpenTide had hired students and bloggers to post remarks about Samsung and also criticise rivals' products. He added that OpenTide gave weekly and monthly reports to Samsung, on online remarks, which indicated that Samsung was fully aware of what was going on. OpenTide was also fined 3m Taiwanese dollars by the commission for its role. The allegations had first come to light in April this year. At that time, Samsung had called the incidents "unfortunate" and said they had gone against the company's "fundamental principles". Was Apple apology in China a good move?